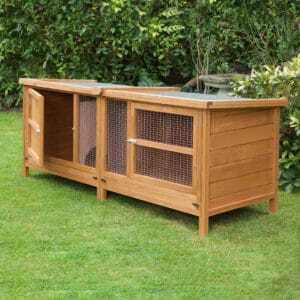 If you want a large rabbit hutch that will really make your pet’s day then our 6ft rabbit hutches are for you. 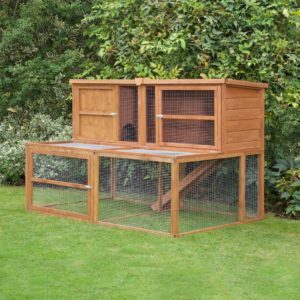 We know that when you want a large rabbit hutch, you want to make sure that it is going to fit in your garden properly. 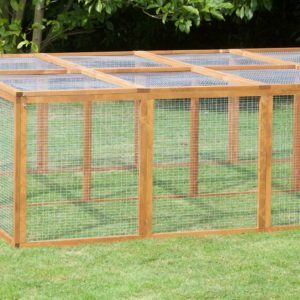 That is why we have a large range of rabbit hutches in stock for you to choose from and we always make sure that they are made out of the highest grade materials so you know that they will last for years without any difficulties. 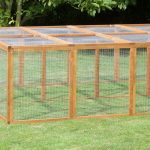 Many rabbit hutch providers sell products that are made out of cheap wood and over time, the rain may make the wood swell and causing problems later on. 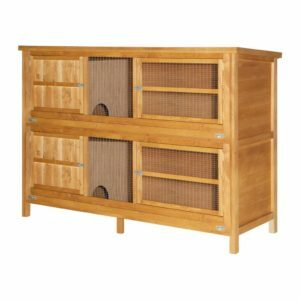 Here at Home and Roost, we have a passion for the pets and believe our rabbit hutches should be of the highest quality so every owner is able to find great pet products for their furry friend. Every one of our hutches is designed with your rabbits wellbeing in mind. We build our rabbit hutches with integrated legs to lift them off the ground. This allows for airflow underneath the hutch which protects against rot and provides your rabbit with protection from standing water during a downpour. Our hutches offer a private space for your rabbit to relax and feel secure. We take pride in ensuring that the materials that go into our rabbit hutches are top quality and are safe for your rabbit. All of the wood we use is treated with an animal safe preservative so if your bunny decides to take a nibble, they will be just fine. Our 6 foot hutches allow for more activity and an active rabbit is a happy and healthy rabbit. We’re all pet owners here at Home and Roost, we understand the importance of pet safety from predators and the distressing effect this can have on both you and your pets. With this in mind we have designed our rabbit hutches with protection in mind. The screens use mesh smaller than 1 inch so nothing can reach into the cage. The hutches are built to be tough to help stop foxes and badgers that make take an interest. Having a large 6ft rabbit hutch ensures that at night your pets are tucked away in the large sleeping area. Being out of sight and away from prying eyes is the best line of defence only larger hutches can provide. All of our runs also come with mesh tops to stop hawks from getting in from above. Rabbits are like people, and sometimes they just don’t get on. 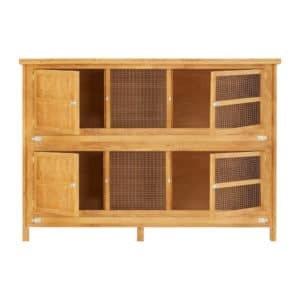 If you have two furry friends that don’t see eye to eye the 2 Tier 6 foot hutch will be a lifesaver. It has a top and bottom enclosure so you can keep your rabbits separate. Both floors have an open section and a large sleeping area separated by a dividing panel with a permeant entrance. Each level is designed to safely allow your pets wander around and have some alone time whenever they feel like it.The other has a screen front for fresh air and to allow your rabbit a good view. 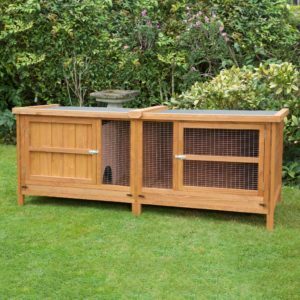 If you’re looking to give your rabbit some additional luxury, try our 6 foot double hutches. These extra roomy hutches have a top and bottom floor connected by a ramp. Half of the upper story is a private enclosure that offers your rabbit a cosy place to sleep. The rest of the hutch has a screen front so your rabbit can look out and get plenty of fresh air. Your pampered rabbit will have lots of room in their hutch to play and relax. If you need a rabbit hutch that does not obstruct views from a window or has height restrictions, our single level 6 foot rabbit hutch is what you are looking for. This hutch offers plenty of room and can be placed discreetly against a house or anywhere in the garden. Anybody with a larger garden can opt for one of our giant hutches. 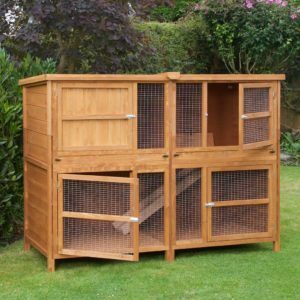 These 6 foot hutches combine a hutch and run so your rabbit has room to play and exercise. It also gives your rabbit access to plenty of grass and lots of spare room. 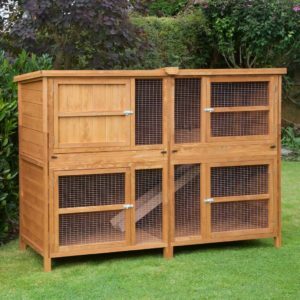 Our 6ft rabbit hutches are manufactured using the highest standard of technology and we have some of the fastest delivery times in the industry so if you’re looking for snappy delivery With quality tracking and notification, you know you can count on Home & Roost to get the job done. 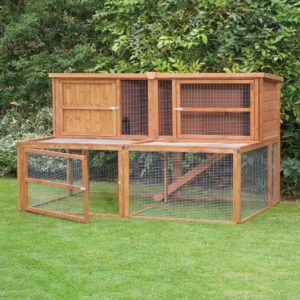 Our 6ft rabbit hutches are available in double tier and one tier designs and we have hutch huggers, rain covers and cold weather insulations available as well so you can keep your hutch protected. With rabbit runs also available, we have one of the best collections on the internet and we are always updating our stock so why not take a look to see what else we have to offer. If you don’t quite know what you need, you can browse all of our rabbit hutches or contact us and we’ll do our best to meet your requirements.